If you are in the market for an unobtrusive surveillance camera that can be mounted in an out-of-the-way place, then the Bosch VC86775T 0.33-inch B/W Camera with 4mm Fixed Lens is for you. The VC86775T is a compact, black-and-white camera with its own built-in Electret microphone and standard alarm input for connecting external sensors, making it perfect for discreet surveillance or monitoring the doorway of your home or small office. 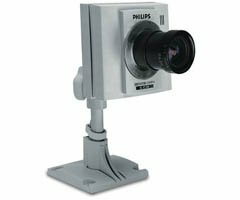 This monochrome camera utilizes a 0.33-inch CCD (charge-coupled device) sensor, with 512-horizontal by 492-vertical active picture elements according to the EIA (Electronic Industrial Alliance) standard. This produces a resolution of greater than 380 TVL (TV-lines) with a S/N (signal to noise) ratio of better-than 48 dB. The Axis VC86775T comes with a standard CS-mount, 4mm (F1.2) lens with a light sensitivity of 0.2 Lux. Powered by 9.6 to 27 volts DC (via system cable), this unit uses a telephone-style (modular) connector. This camera can operate in temperatures from -20 to 45-degrees Celsius. In short, the Bosch VC86775T is a reliable and economical addition to any monitoring system. Designed to be unobtrusive, the VC86775T is compact, yet this unit can operate in extreme temperatures and low-light conditions. Users should note that the CCD sensor may become permanently damaged if exposed to long hours of direct sunlight or halogen light.